"Eclipse" seems a strange way to describe a transit of Venus, when the word also means "deprivation of light". We can detect the planets of other stars by seeing this, but only just, and would never notice on Earth if Venus were in front of the Sun or not. And, that to enable that calculation, observation from distant parts of the Earth were necessary, and one of the objectives of James Cook's first circumnavigation of the Earth was to see the transit of Venus from Tahiti, in 1769. So the Transit of Venus is an exciting and important part of the development of physics, astronomy, geography and exploration! All quite as exciting as that dramatic image of the sun in ultraviolet! I remember watching it right in front of my house back in 2004. Then they called it a Transit of Venus instead of a Venus Solar Eclipse. I was lucky because in the Toronto area it happened just a few minutes after sunrise, when I could look directly at the Sun with my own eyes. I could see Venus with my own eyes. It was a black dot on the lower part of the Sun instead of the upper like in the photograph. Lower part being the part closest to the horizon during the sunrise. JohnD wrote: "Eclipse" seems a strange way to describe a transit of Venus, when the word also means "deprivation of light". We can detect the planets of other stars by seeing this, but only just, and would never notice on Earth if Venus were in front of the Sun or not. How do we know how far away the Sun is? Now we use radar to establish our distance from celestial objects, but before there was radar, we had to resort to trigonometry to figure out the astronomical unit (AU)—the distance between Earth and the Sun. In 1677, English astronomer Edmond Halley (of comet fame) proposed that a transit of Venus—and some geometry—could be used to determine the astronomical unit. Though Halley died in 1742, which was 19 years before the 1761 transit of Venus, other scientists followed his suggestion and journeyed to the ends of the Earth to make the necessary observations. The astronomical unit obtained from these observations, roughly 95 million miles, is respectably close to our current measure of 92,955,807.267 miles (149,597,870.691 kilometers). I remember reading about Halley's call to action that he made back in 1677 re the 1761 transit of Venus. I found it a little amusing that he said expeditions should be planed "with all possible dispatch!" so long before the event. With our eyes, that's true. But our instruments which monitor total solar flux easily detect the decrease in intensity of the sunlight during a Venus transit. In this picture, Venus is the size of a rather big and dark sunspot against the disk of the Sun. I guess that when astronomers monitor other stars to determine if they have planets, a sunspot on another sun might fool astronomers into thinking that they have detected an exoplanet. Oh well. I guess follow-up observations would show that the sunspot was not a planet. Ann wrote: In this picture, Venus is the size of a rather big and dark sunspot against the disk of the Sun. I guess that when astronomers monitor other stars to determine if they have planets, a sunspot on another sun might fool astronomers into thinking that they have detected an exoplanet. Yup. They're actually called starspots. And they produce variability that is equivalent to planetary transits. So it normally requires detecting a minimum of three transits to provisionally confirm you've detected a planet. Starspots themselves can provide useful information about the rotation of other stars. I don't think the public really has much of any idea of the sun's size compared to the earth, and a neat feature of this photo is that it gives some idea of the relative sizes of the sun and Venus, and therefore of the sun and the earth. Of course, Venus is only a little over a quarter to the way to the sun from the earth in this picture, so the viewer needs to imagine its disc shrunk to a little more than one quarter of what it is in this picture. representation of the Sun/Earth relative size. If the transit takes a whole day or more it is probably a starspot. If it is a starspot that returns then the return time should be exactly twice the transit time. Yeah, but often the starspots aren't that stable, so when they return they're a different size and not obviously the same ones. And on stars with fast rotation and a lot of activity, there tend to be a lot of starspots, which further confuses things. So, when will the next Earthian transit of the Sun be seen from Mars? <<No one has ever seen a transit of Earth from Mars, but the next transit will take place on November 10, 2084. 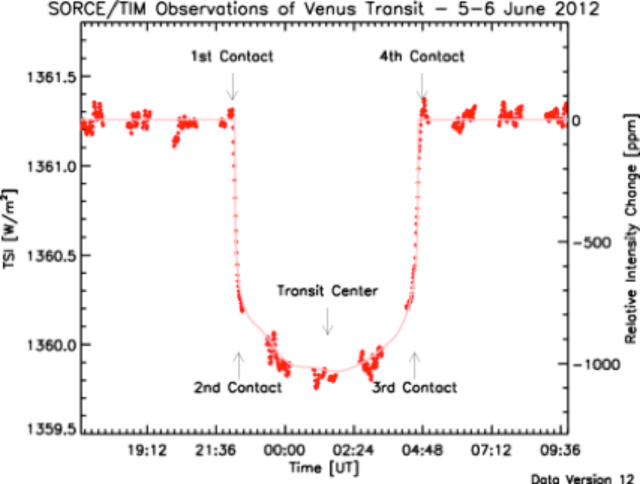 The last such transit took place on May 11, 1984. A science fiction short story published in 1971 by Arthur C. Clarke, called "Transit of Earth", depicts a doomed astronaut on Mars observing the transit in 1984. During the event, the Moon could almost always also be seen in transit, although due to the distance between Earth and Moon, sometimes one body completes the transit before the other begins (this last occurred in the 1800 transit, and will happen again in 2394). A transit of Earth from Mars corresponds to Mars being perfectly uniformly illuminated at opposition from Earth, its phase being 180.0° without any defect of illumination. During the 1879 event, this permitted Charles Augustus Young to attempt a careful measurement of the oblateness (polar compression) of Mars. He obtained the value 1/219, or 0.0046. This is close to the modern value of 1/154. Much more recently, better measurements of the oblateness of Mars have been made by using radar from the Earth. Also, better measurements have been made by using artificial satellites that have been put into orbit around Mars, including Mariner 9, Viking 1, Viking 2, and Soviet orbiters, and the more recent orbiters that have been sent from the Earth to Mars. Well, yes, Chris, with your super-duper instruments that are modern astronomy. And they can detect a whole 1.5 watts/m^2 change in the Sun's radiance as Venus crosses it's disc, that's 0.11%. Remarkable, extraordinary, laudable. But I still stand by my statement that we, humans (not astronomers!) cannot tell if Venus is there or not, and compared with the same situation with the Moon it's not an eclipse! JohnD wrote: Well, yes, Chris, with your super-duper instruments that are modern astronomy. And they can detect a whole 1.5 watts/m^2 change in the Sun's radiance as Venus crosses it's disc, that's 0.11%. Remarkable, extraordinary, laudable. But I still stand by my statement that we, humans (not astronomers!) cannot tell if Venus is there or not, and compared with the same situation with the Moon it's not an eclipse! Well, sure. I said as much. I was just addressing the comparison between a Venus transit from Earth and the sort of transits we are able to detect by planets around other stars. Technically, it isn't incorrect to call such events eclipses. "Eclipse" is a blanket term that covers any sort of obscuration, both partial (transit) or total (occultation). But certainly, "transit" is more precise. FWIW, it is possible to see a Venus transit with the naked eye just like we see sunspots, typically with the Sun attenuated by smoke, clouds, or near sunset/sunrise. There's no solid evidence anybody did so before modern times, but there are weak indications. Of course, many astronomical things were probably observed in ancient times and never recorded. <<An eclipse is an astronomical event that occurs when an astronomical object is temporarily obscured, either by passing into the shadow of another body or by having another body pass between it and the viewer. This alignment of three celestial objects is known as a syzygy. Apart from syzygy, the term eclipse is also used when a spacecraft reaches a position where it can observe two celestial bodies so aligned. An eclipse is the result of either an occultation (completely hidden) or a transit (partially hidden). During a solar eclipse, the Moon can sometimes perfectly cover the Sun because its apparent size is nearly the same as the Sun's when viewed from the Earth. A total solar eclipse is in fact an occultation while an annular solar eclipse is a transit. Chris notes that a transit at sunset (or sunrise) with sunlight attenuated by the greater depth of atmosphere, is observable, naked-eye, and De58te wrote above of doing just that. But should this responsible site not record and support an absolute prohibition of looking at the Sun without protection for the eye? JohnD wrote: Chris notes that a transit at sunset (or sunrise) with sunlight attenuated by the greater depth of atmosphere, is observable, naked-eye, and De58te wrote above of doing just that. I suppose the editors can opt for whatever advice they like in their captions and their comments. I would never make such a claim. It is not dangerous to look (without staring) at a Sun attenuated by the atmosphere to the point where the blink or aversion response is no longer present. My advice would be to exercise care, but don't deny yourself the opportunity to see first hand one of nature's interesting sights (e.g. sunspots on a setting Sun).